Samsung's revolutionary 8 Gb LPDDR4 DRAM and what it means for you. 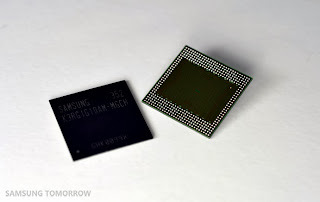 Last year, well a few days ago, Samsung announced the first 8Gb (eight gigabit) LPDDR4 RAM for mobile devices. This is seriously pushing the boundaries. The new ram will be fabricated on a 20 nm class process technology. Being the leader in mobile DRAM, Samsung waits for no one to come out with this ultra-fast RAM. This DRAM has the largest density available, with 1 GB on a single die. The LP stands for low power, aiming directly at the mobile market. It will also have the highest level of energy efficiency for mobile memory applications. Samsung states that up to 4 8Gb chips can be placed on a single 4 GB LPDDR4 package and it wil be the highest level of performance available today. Most likely accompanying the 64-bit Exynos processor likely coming early 2014 and Qualcomm 64-bit processors following, the LPDDR4 RAM maybe able to come in market with the release of the Galaxy SV. With this ultra-fast RAM, your future mobile device will be one step closer to being a complete replacement for your PC or Mac.